BEFORE: There was a significant Tripping hazard between the concrete walkway and granite curbing. 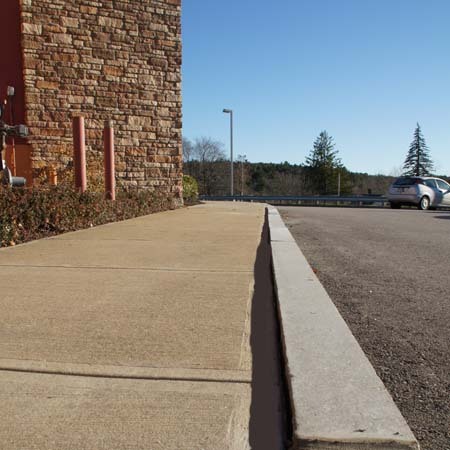 AFTER: Slabjacking quickly raised the concrete walkway, eliminating the tripping hazard before the dinner rush. Concrete Problem: The concrete walkways around the existing restaurant had differentially settled, causing multiple significant tripping hazards to pedestrians. The concrete slabs were reportedly poured on frost-laden soils during the winter months, most likely resulting in this differential settlement. Project Considerations: The restaurant incurs significant pedestrian traffic and construction operations would negatively impact the existing business. The walkways were especially busy during lunch and dinner hours and there were no favorable times to replace the walkway slabs. Slabjacking Services Provided: Engineered Foundation Technologies performed a pressure grouting technique, known as slabjacking, to lift the concrete. 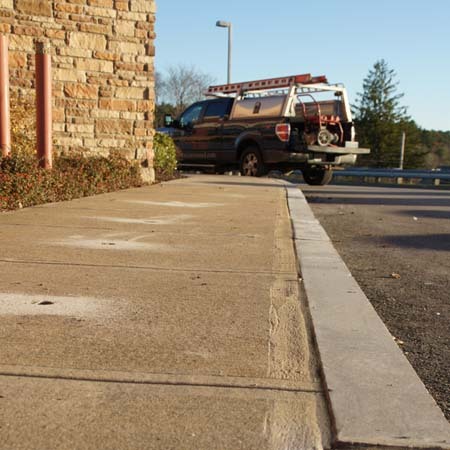 Slabjacking is an alternative to traditional "rip and replace" methods of concrete repair. It greatly benefited the existing businesses by repairing the tripping hazards with minimal impact to the facility. The project was successfully completed in one working day. "The client was very pleased as the concrete walkways were rapidly fixed in a few hours. The problem was solved for a fraction of the alternative solutions."